If you enjoy working out on a regular basis, you will find that compression shorts can be very helpful when it comes to preventing muscle tears, sprains, and other potentially serious injuries. It is important that you make a point of exploring some of these clothing options so you can find shorts that will match your needs perfectly. We’ve previously reviewed various shorts for crossfit but in this article we specifically target compression shorts used in workouts. These are some of the best compression shorts on the market right now, so you will want to learn as much as possible about them before deciding on anything in particular. The HeatGear Sonic compression shorts from Under Armour are up to military standards, and they will protect your muscles while keeping you warm during your workouts. This is one of the better companies when it comes to these shorts, so they are definitely worth looking into. The extremely durable material these shorts are made out of means they will stand the test of time. 4-way stretch fabric that holds its shape no matter what. Some might find these shorts to be too constricting. Nike’s pro Core Combat Compression Shorts are designed for complete ventilation and have an extraordinarily solid design. This company is certainly known for the quality of its athletic apparel, and these shorts are quite impressive. If you are looking for a comfortable pair of compression shorts that you can wear on a regular basis, these are a great overall option. Strong material that holds up well with regular use. Designed for excellent ventilation, even during intense workouts. Elastic waistband for total comfort. A bit too expensive for some people. The Powerflex shorts from Champion Men are another great option that you should keep in mind before making a final purchase. These shorts use special Vapor Quick Drying Technology to ensure that any sweat they accumulate dries quickly. Sweating is simply unavoidable when working out, but these shorts make it less of an inconvenience. The brand is very reputable and these shorts have a lot to offer overall. Designed to dry sweat quickly to avoid chafing and discomfort. High-quality material that doesn’t rip or tear easily over time. Versatile design for use in any physical activity. The Endurance Pro Shorts offer the exact kind of support you need to get through every workout without any injuries or muscle damage. These shorts provide more compression than the average pair, which is why they are one of the more popular options available. The extra support that you will get in your hips and lower back will be sure to make a huge difference. You will be hard-pressed to find a pair of compression shorts that are quite as comfortable and effective as these. Designed to stabilize hamstrings and quadriceps. Thick material that is durable and long-lasting. Wicks moisture for less chaffing while working out. Breathable design with plenty of ventilation. Waistband can fit a bit tight for some. These Adidas compression shorts will help keep the sweat and chafing away while you are working out. Whether you are running five miles or lifting weights at the gym, these shorts can be quite useful. The compression that these shorts offer will help you get more out of each work out by reducing muscle vibration. There are a lot of great things about these shorts that you should keep in mind, including their tough and durable material. Durable material that will last for years through regular use. Ergonomically-shaped gusset for additional comfort. Designed to reduce muscle vibration to extend workouts. Strategically-placed flatlock seams to prevent chafing. Requires a bit of maintenance to keep clean and make last. Neleus Men’s Compression Shorts offer a strong compression that can prevent muscle damage and fatigue, allowing you to keep working out longer than usual. These shorts are available for a very reasonable price, and they will last a long time. They are designed to prevent chafing, so you stay comfortable for the duration of your workouts. This makes for a very nice base layer in your workout clothes, and it is highly rated by many customers. Great compression for effective prevention of muscle strains and injury. Lightweight design that will keep you moving fast. Breathable material with excellent ventilation. Some people might have issues with shorts fitting them properly due to qualify control issues. The Skins A200 Compression Half Tights are sturdy and get the job done when it comes to protecting your muscles from injury during workouts. They are designed for comfort, so you shouldn’t have any problems when it comes to getting through your workouts and enjoying them fully. One of the truly unique things about these shorts is that they offer UV protection. If you tend to go running outside a lot, these shorts are a great investment to make. UV protection for outside exercise to prevent sunburn. Comfortable design that cuts down on moisture and chaffing. Flexible enough to be used for running or jogging and many other forms of exercise. Quite a bit more expensive than the average pair of compression shorts. CompressionZ Men’s Shorts are highly versatile, as they can be worn as either outer or underwear. You can use these shorts for just about any physical activity, so you should be able to get plenty of use out of them. These shorts are designed to wick sweat, so you don’t have to deal with all of that annoying chaffing. No matter what types of activities you enjoy engaging in for exercise, these shorts should serve you very well. These shorts go extremely well with the CompressionZ socks on the market also. Dries quickly so chaffing isn’t so much of a problem when working out. High-performance fabric that holds together for a long time. Designed to increase circulation throughout the body. Flexible design that allows for use during any physical activity. Can be a bit constricting in the crotch area. The Tesla Compression Baselayer Cool Dry Sports compression shorts are among the very best options available on the market right now. You can count on these shorts to last a very long time even with regular use. The amazing elasticity and ventilation means that you will be able to stay comfortable throughout your workouts from start to finish. These are appropriate for use in all different seasons, whether hot or cold. You simply will not find a more versatile pair of compression shorts. These compression shorts are unique for a number of reasons, including their copper-infused fabric that makes it easier to recover much faster than normal. If you work out on a regular basis, you will definitely want to think about picking up a pair of these. Durable copper-infused fabric that boosts recovery times for faster progress. Ultra-comfortable design that will allow you to work out longer. Can be used for just about any physical activity. A bit lighter than some people might like. You will quickly find that there are a lot of amazing benefits to wearing compression shorts during your workout. The more time you take to learn about what these shorts can offer you, the more likely you will be to buy them. Compression shorts can really help with avoiding muscle fatigue so it doesn’t become a problem with your workouts. This means that you will be able to start going longer when you work out so you won’t have to worry about getting slowed down at all. These shorts make it easier to be more productive, which in turn will help you meet your fitness goals faster. Muscle strains can be extremely painful and counterproductive for those who want to get in shape. Compression shorts hold the muscles firmly in place to help you avoid straining them while you are working out. The fact is that it’s far too easy to injure one’s self when working out in normal clothes, so it’s a good idea to invest in these shorts. Sometimes a certain amount of muscle soreness is unavoidable when working out regularly, but compression shorts can significantly lower the risk of this problem. The sorer you are, the more difficult it will be for you to keep working out with maximum productivity. Your recovery time can be seriously slowed by damage to the muscles, thereby hindering your progress. If you want to start increasing the time it takes for your muscles to recover from intense workouts, it is a good idea to start looking into compression shorts. These shorts minimize muscle damage, so you won’t have to wait as long to get back in the gym between sessions. One of the primary benefits of wearing compression shorts is that you will be able to improve your blood circulation. This can allow your body to tolerate longer and more intense workout sessions, which will get you closer to your ultimate fitness goals. The increased blood flow provides the cells with the oxygen they need, making it easier to last longer when engaging in physical exercise of any kind. There are certain brands that are better than others when it comes to high-quality compression shorts. The more you learn about these brands, the easier it will be to purchase the right shorts to match your needs. SKINS: This company makes quality compression shorts that are highly durable and designed to support the muscles. Nike: There is no company with a more prestigious reputation for great athletic wear than Nike. You will pay a little bit more for this brand, but it’s well worth the additional expense. We’ve covered the brand’s crossfit shoes extensively on this site. 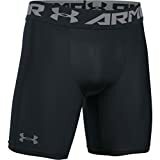 Under Armour: This is a much more affordable option for those who want quality compression shorts that are very effective. 2XU: One of the best brand names for comfortable compression shorts that increase muscle recovery times. The brand of the shorts is definitely important, because it will ultimately determine how much you spend and whether or not you get your money’s worth. You will also want to pay close attention to the material of the shorts. The material that your compression shorts are made out of should be comfortable yet durable. The last thing you want is to wear shorts that make it difficult to work out for long periods of time because they are uncomfortable. Some of these shorts are made with higher-quality materials than others, so you will need to keep that in mind. You should determine how much you want to spend on compression shorts before you start looking into your options. It is possible to get a good pair of these shorts without spending a ton of money. If you are on a tight budget, you should be able to find a number of inexpensive options. There are lots of different compression shorts that you can choose from, but not all of them will provide you with the same level of durability, comfort, and overall effectiveness. You will want to keep in mind what type of activities you engage in so you can get the right pair to match all of your needs. What Cross Training Should Runners Do?